Men's 3 PC 100% Cotton Monogrammed Handkerchiefs Initial Letter Hanky by Dapper World at Mas Fashion. MPN: DWIH3701. Hurry! Limited time offer. Offer valid only while supplies last. The personalized cotton handkerchiefs come boxed in a set of three and each one is embroidered with a single initial in navy, burgundy and silver. 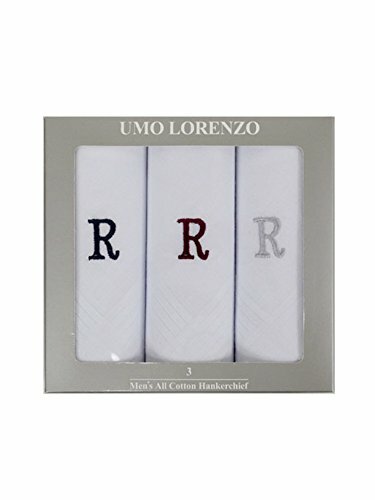 The personalized cotton handkerchiefs come boxed in a set of three and each one is embroidered with a single initial in navy, burgundy and silver. The soft 100% cotton hanky is 16'' x 16'' and finished with a rolled, stitched edge. Functional and elegant, they are an essential accessory for every traditional man. If you have any questions about this product by Dapper World, contact us by completing and submitting the form below. If you are looking for a specif part number, please include it with your message.